Large articulated trucks used to park their trailers under this and lots of fleece used to come out the building on hooks and be dropped into the trailers. The mill will house 22 homes with commercial space on the ground floor and the site will be developed with a further 100 homes. Work is expected to start in May 2018 and be completed by July 2020. 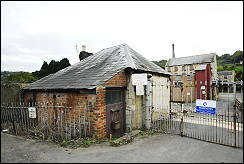 This mill has a history dating back to 1601 when William Webb re-leased Doleman’s Ham Mill to Nicholas and Thomas Webb. In 1685 there was a court case concerning Samuel Webb’s right to the title of Ham Mill which at this time consisted of two fulling mills, one gig mill, one grist mill, five racks, a dyehouse and a press house. William Marling was occupying the mill in the early nineteenth century. The mill remained in the hands of the Webb family until the middle of the eighteenth century. In 1825 William Marling took his son into partnership, and seven years later Samuel Stephens Marling and Thomas Marling joined them, the mill being run in conjunction with Fromehall Mill. A 30 hp steam engine and three water wheels of around 10 hp each provided power for the mill. 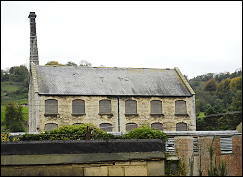 Thomas and Samuel Stephens Marling installed 45 power looms in the mills. In 1838 the mill was assessed at £375. 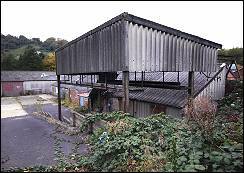 1846 saw the mill in the hands of Nathaniel Samuel Marling who leased the mill and other buildings to Thomas Barratt, turner for £334 10s a year. At this time the three waterwheels were connected to an iron shaft that went to the floor above that contained stocks and gigs. Thomas Barret did not stay here long, as an inventory of Nathaniel Stephens Marlings possessions made in 1853-4 shows that a Thomas Sampson (a shawl maker) was named as the tenant..
By the 1860’s, Alfred Ritchie was making cloth at Ham Mill. A record from 1870 mentions a loom shed, wool sorting and burling shops, wool stoves and dyehouses, carpenters shops and blacksmiths shops, willy house, boiler house, yarn and stock warehouses and a 40 hp steam engine. In 1880 the building was leased to Elliot and Ritchie for seven years. In 1889 there were 85 looms and 4,560 spindles. The mill was closed in 1899. Carpets were last manufactured at the mill under the name of Carpets of Worth. 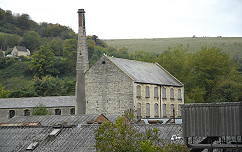 The mill often has open days when the general public are given guided tours.